LOS ANGELES ó Celebrity blogger Perez Hilton is being stalked by paparazzi _ in court, at least. X17 Inc., a Los Angeles photo agency known for its images of stars in personal or embarrassing moments, has filed a $7.6 million federal copyright infringement lawsuit against Hilton. Hilton's Los Angeles-based site, PerezHilton.com, posts tabloid photos of celebs and adds cheeky captions and rudimentary doodles. 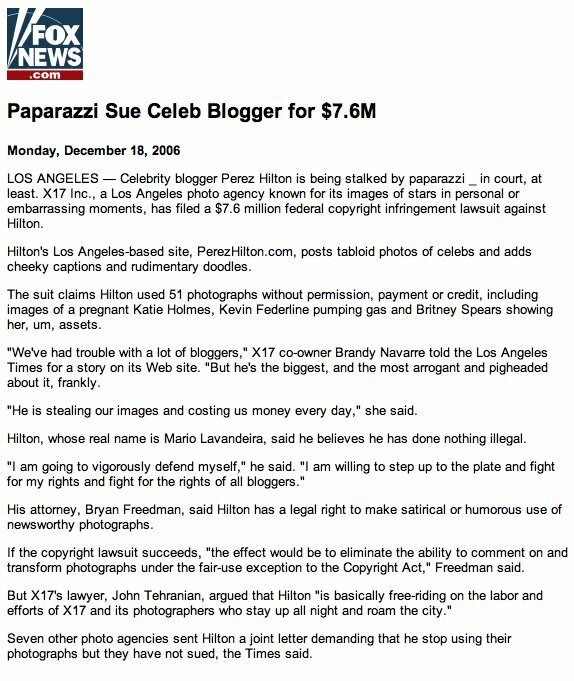 The suit claims Hilton used 51 photographs without permission, payment or credit, including images of a pregnant Katie Holmes, Kevin Federline pumping gas and Britney Spears showing her, um, assets. "We've had trouble with a lot of bloggers," X17 co-owner Brandy Navarre told the Los Angeles Times for a story on its Web site. "But he's the biggest, and the most arrogant and pigheaded about it, frankly. "He is stealing our images and costing us money every day," she said. Hilton, whose real name is Mario Lavandeira, said he believes he has done nothing illegal. "I am going to vigorously defend myself," he said. "I am willing to step up to the plate and fight for my rights and fight for the rights of all bloggers." His attorney, Bryan Freedman, said Hilton has a legal right to make satirical or humorous use of newsworthy photographs. If the copyright lawsuit succeeds, "the effect would be to eliminate the ability to comment on and transform photographs under the fair-use exception to the Copyright Act," Freedman said. But X17's lawyer, John Tehranian, argued that Hilton "is basically free-riding on the labor and efforts of X17 and its photographers who stay up all night and roam the city." Seven other photo agencies sent Hilton a joint letter demanding that he stop using their photographs but they have not sued, the Times said.